Want to build quickly and easily? Power tools are probably the answer. While woodworking will always be about wood, power tools can help considerably speed up the job. In this class we cover not only how to use power tools but the different techniques of using the power tools. You will cut straight lines using the circular saw, curves using the jigsaw and create various effects using the router. And ofcourse safety and precautions will be taught first and foremost. What you build is what you take home. For the last 10 years he is living proof that even a small home in Mumbai can turn into a woodworking workshop. Working from 10 pm to midnight he has, over the years, turned out items of furniture ranging from a small shoe rack to a large 7×6 foot bed. He also makes wood puzzles and miniature furniture and is obsessed with designs that do not need metal fasteners. He has quit a career of 15 years and now teaches woodworking. When not working wood, he can be found drilling holes in walls, changing faulty switches or fixing leaky taps. He could also be elbow deep in cake batter or playing with the colony pups (children); he does play with the strays too, but that's something we won't talk about now. 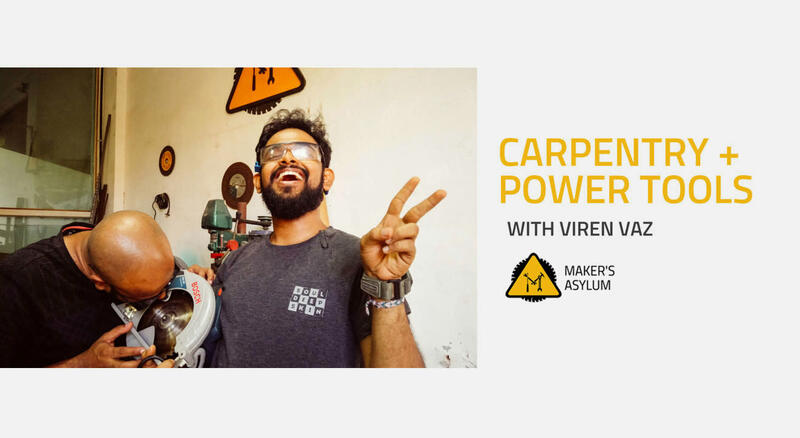 Viren is eager to learn as much as he can about various materials and working techniques and is equally comfortable talking about pottery, stone carving and welding as he is woodworking.